As proud supporters of Watford FC, Stylist Liam Bray joined WFC Captain John Eustace and players Lee Hodgeson and Kevin Reese in a game of golf for a charity day at West Hertfordshire Golf Club. 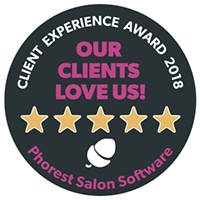 Cienté in Berkhamsted would like to congratulate Natale and Paul on becoming Colour Expert’s, one of the highest colourist qualifications achievable, from professional hair colour house Goldwell. The artistic team at Cienté swapped Berkhamsted for the art deco grandeur of Claridge’s ballroom last week when they helped British couturier Nicholas Oakwell launch his new spring collection. Expecting staff to attend business meetings on a Sunday evening and having stylists trained by a shaven-headed ex-professional footballer are just two of the quirky reasons that Berkhamsted salon, Cienté, is MAD (Making a Difference). Male stylists from top salon Cienté had their designer stubble shaved off at a charity event last night in preparation for Movember, the moustache-growing charity.